From the footage of the ethereal children, the film moves deftly to show an A4 Skyhawk descending into the inner sanctum of an aircraft carrier, and finally to passengers sleeping on a ferry returning from the Japanese island of Hokkaido. One critic remarks that the whole world of the film resides in this juxtaposition of images. From light, to dark, and back to light. 2. Marker’s film consists of footage from Japan, Iceland, and Africa. The images match Krasnor’s letters. One gets the sense that they are watching footage taking by Krasnor. 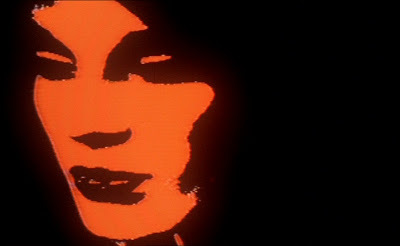 This mysterious cinematographer is Chris Marker’s alter ego. Some of the footage is from San Francisco. 3. 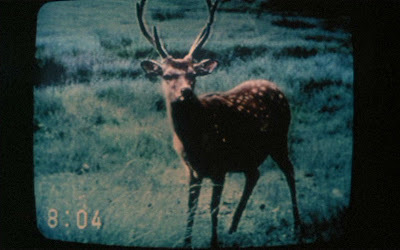 The two chief frames of reference are Alfred Hitchcock's Vertigo and Andrei Tarkovsky's Stalker. The former is especially poignant. At one point, Sandor Krasna goes to those very same places that Jimmy Stewart's character visits in Vertigo. It is a pilgrimage of sorts. Strange how many of the sites from 1958 San Francisco (the year Hitchcock made Vertigo) still exist in 1982 San Francisco. The latter film becomes more important towards the end of Sans Soleil. 4. Most of the footage is unmistakably urban. Some of it is familiar. We see a high-traffic street crossing bearing a distinct similarity to Shibuya, for example. In others, the rusty spans of the Golden Gate bridge rise from a bank of mist. In another image, an Icelandic village is buried under meters of volcanic soot. 5. A note on sound. Modest Mussorgorsky's Sans Soleil is played on different instruments. Sometimes it is a Moog. On others, it is a theremin. One can also hear curious, bubbly, reverb-saturated synth effects in the background. They give the film a science-fiction feel. 6. The name Unseen Sun may immediately recall the similarly-titled track, "Invisible Sun", from the Police's 1982 album The Ghost in the Machine. It is also the translated German title for Chris Marker's 1983 film, Sans Soleil (Sunless). That these two works -- an album and a film -- were released within a year of each other is coincidental. And to add to the coincidences, I only remind the reader that only three years later, in 1986, German media theorist Friedrich Kittler published his influential Grammophon, Film, Typewriter (Brinkmann & Bose Verlag, 1986). The introduction to this book, translated into English for the summer 1987 issue of October was one of the first English crossovers of Kittler's writings. It also features Kittler's famous "derivation" of the Lacanian real, imaginary, and symbolic "from the data channels of phonograph, cinema, and typewriter." Lost at the end of the world, on my island Sal, in the company of my dogs strutting around, I remember January in Tokyo, or rather I remember the images that I filmed in January in Tokyo. They have put themselves in the place of my memory, they are my memory. I ask myself how people remember if they do not make movies, or photographs, or tapes, how mankind used to go about remembering. 8. Sans Soleil features many images of television and urban screens. In a series of stills, celluloid images of television screens are depicted as lantern slides. These images feature ghostly circles of light radiating from within. The juxtaposition of media technologies is striking. Kittler's media theory (not just in GFT but in Discourse Networks, its predecessor) is the most advanced I have encountered, as Marker ranks among the most sophisticated of filmmakers. Kittler's most important predecessor is perhaps McLuhan, his most direct influence Foucault. For Marker, Tarkovsky is "le maître", but there is little precedent for the full-blown essay form that emerges in Sans Soliel, expcept perhaps Vertov's Man with a Movie Camera, Resnais/Marker's Toute la mémoire du monde and Les Statues meurent aussi. Thank you for putting these thoughts down - I had forgotten that Kittler evokes Sans Soleil and you restored this evocation to my memeory. Stop by chrismarker.org sometime... Peace out.